A slight revision to my previous blog post ; ‘Cycling For Dummies’ does exist, I am reliably informed. My apologies to the authors for doubting its existence! In fact, I feel like I could do with a copy of the book myself at the moment. Even with three Grand Tours under my belt, I still have so much to learn about the sport and its history. This was patently obvious to me on Sunday during the team time trial, something I have never properly seen before. It’s cycling’s equivalent of Marmite apparently, with the love/hate/love split amongst the fans and teams. I think that following the performance of Bradley and his lieutenants on Sunday, Team Sky may just be firmly in the ‘love’ camp. Famed for their acute attention to detail, the ‘TTT’ is all about working as a team to ensure the best group time. The lead rider provides shelter to his supporting group, and they rotate at the front to try and maintain a constant high speed. (Similar to the Olympic track event, the team pursuit). Once again, Bradley (a former gold medalist in the team pursuit) showed us all his class – performing turns on the front of the group that the commentators described as ‘enormous’. The other lasting impression is that bike racers are strong. Really, really, strong. People think that ‘ironman’ races must be the toughest sport, but try doing it for three weeks in a row. There are very few sports that come close. Extreme marathon running, maybe. I’m going off topic (again) – anyway, the Team Sky boys put in such a huge effort that they were rewarded by winning the ‘Maglia Rosa’ (pink jersey) – the legendary leader’s jersey and the one that Bradley and the team are giving everything to win. It was on the young Italian shoulders of Salvatore Puccio that the jersey fell thanks to his position from stage one, and he’ll remember that for the rest of his life. I wasn’t joking when I said last week that the Giro is the biggest race in the world for Italians, bar none. I am now also being reminded just how much work goes into running the on-race team as a smooth operation. The mechanics and I were chatting the other day, and we have unanimously decided that professional cycling is probably the least logistically friendly sport in the world. Let’s just say that stadiums do a lot to ease the life of those involved in sport. Grand Tours, like the Giro, require levels of organisation that are utterly mind boggling – more about this next week when we move up towards the mountains and everything gets even more complex. I think it’s that difficult lifestyle that means bike riders are often very personable. There’s not much room for a prima donna in amongst the huge physical challenges, travel, and long time spent away from home and families. In fact, the most common reaction I’ve seen when people meet riders for the first time is just how, well, normal they so often are. 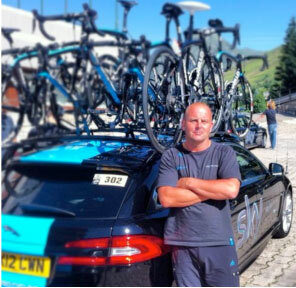 On Saturday, I walked outside the team hotel and the super-friendly Sergio Henao had stolen some washing fluid and started giving the Jaguar windows a wipe down! Funny how many people want my job, I must admit.